The Chamblee tennis teams advanced to the Class 5A Sweet 16 round with a pair of 5-0 sweeps of Johnson-Gainesville on Tuesday at Sugar Creek Tennis Center. The two-time reigning Class 5A girls’ state champions Chamblee Lady Bulldogs improved to 19-1 with their 5-0 sweep of Johnson (5-6) losing just one game in the five matches. Senior Grace Pietkiewicz upped her record to 16-1 on the season with her 6-0, 6-0 win over Morgan Langley to pick up the first point of the match for Chamblee. The second point for Chamblee came from the No. 2 doubles team of sophomores Samantha McCrery and Allison Lvovich who improved to 3-0 as a team with a 6-0, 6-0 victory over Johnson’s Grace Vanhooser and Viviana Medina. The No. 1 doubles team of junior Madison Trinh and senior Madeline Meer (5-2) clinched the match with another 6-0, 6-0 win in taking down the Johnson duo of Zoey Blankenship and Beth Odum. Sophomore Neena Katauskas (9-1) finished with a 6-0, 6-0 win over Anna Cooper and sophomore Lila David rounded out the sweep with a 6-0, 6-1 victory against Haley Grimes. Chamblee will host the Decatur in the Sweet 16 round of the playoffs with a date and time to be set. The Bulldogs (15-5) gave Chamblee the sweep of the first-round matches with an identical 5-0 victory over Johnson (3-8) while also losing just one game on the way to the win. Sophomore Hap Howell (8-8) logged the first point of the match for Chamblee with a 6-0, 6-0 score over Johnson’s Ethan Bruce at No. 3 singles. Freshman Andrew Pietkiewicz (8-4) cruised to a 6-0, 6-0 shutout of Garrett McCarthy at No. 1 singles to put the Bulldogs within one win of advancing. 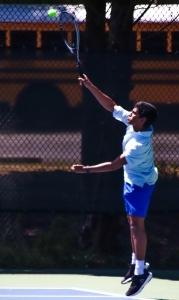 The match clinching point came from senior Eshaan Agrawal (5-2) at No. 2 singles as he knocked off Johnson’s Jackson Barkley 6-0, 6-0. The No. 1 doubles team of Carter Difonzo and Bryce Starks upped their record to 6-1 via a 6-0, 6-0 sweep of Johnson’s AJ Buendia and Henry Hernandez to make it 4-0. Nevin Aresh and Chase Starks (3-0) cruised to a 6-1, 6-0 win over Johnson’s Jamie Baeza and Miguel Guerrero at No. 2 doubles to close out the match. Chamblee faces North Springs in the Sweet 16 with day and time to be announced. Three straight set victories in singles propelled Tucker into the Class 6A Sweet 16 for the third consecutive season. Summer Clemons won 6-1, 6-1 at No. 1 singles, Wynter Clemons won 6-0, 6-0 at No. 2 singles and Trinyty Turner won 6-0, 6-0 at No. 3 singles to clinch the match. The Tigers did not fare as well falling 3-0 to Jones County to win up their season. The Druid Hills Red Devils moved into the Sweet 16 for the first time in 16 years with a 3-2 thirller over Northside-Columbus. The 2003 Sweet 16 berth was also the last time Druid Hills won a first-round match. They will travel to West Laurens in the Sweet 16. The Dunwoody Wildcats downed Creekview 3-0 in the opening round of Class 6A state playoffs and advance with a trip to Douglas County in the Sweet 16.